The NY Girls put together a solid showing this past weekend in VA Beach. Finishing in second place overall to Team California, NY crowned two champions, 5 finalists and 7 all-americans. Minisink Valley's Mia Macaluso would win in convincing fashion claiming two falls and a 7-2 decision over London Houston of Washington in the finale. Before Macaulso took the stage, an all New York final took place at 120lbs. Lynbrook's Ally Fitzgerald and Copenhagen's Riley Dalrymple would decide who would be NY's first champion of the night. A takedown in the second proved to be the clincher as Ally defeated Riley 4-3. New York would have three all-americans at 136lbs. Grace Pauls would make the finals by defeating fellow New Yorker Mika Walters 5-1. Pauls would falter to Maggie Palmore of Missouri in the championship bout. On the backside, Walters and Zoe Gress would meet in the consi-semis. Gress would prevail and end up finishing in 4th place. Walters would win her final bout and claim a 5th place finish. Sariah Stewart ended her NHSCA run with as a silver medalist. After two hard fought victories, Stewart earned a spot in the finale against Utah's Kathleen Janis. After a scoreless first, Janis would put a 3 spot on the board to claim the 220lb title. By far, a great team effort was shown by the Empire State Females. With 226.5 points, Team NY were crowned champions of the middle school division. New York would end with 14 all-americans including 90lb champion PJ Duke and 154lb champion AJ Fricchione. Duke's run was quite impressive as he racked up 4 straight pins capped off with an 8-0 major decision and an NHSCA Championship. Fricchione's path was full of points each and every round. Two straight 15-0 tech falls followed by a 6-2 decision landed AJ into the finale against Massachusetts' Joshua Cordio. A back and forth battle with plenty of action came down to the final seconds with Fricchione scoring a take down and 2 nearfall to upend Cordio 11-8. A trio of grapplers ended their weekend with bronze medals. Herricks' Joseph Manfredi would lose to eventual champion Ethan Rivera 6-3 in the semi-finals. At 100lbs, Casper Stewart of Attica-Batavia fell victim to the eventual champion as well. With a longer road on the backside, Stewart would defeat four straight opponents to capture third place. The last of the bronze medalists was Max Gallagher of Bayport-Blue Point. 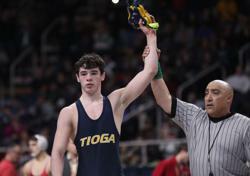 Gallagher, a 2019 NYS bronze medalist at 99lbs, also fell to the hands of the eventual champion. With two solid wins in the wrestlebacks, Gallagher earned all-american status. Other NY grapplers that became all-americans were Brayden Fahrbach (4th @ 90), Gianni Silvestri (7th @90), Andre Lyndaker (8th @ 95), Chris Crawford (7th @ 100), Sulayman Bah (6th @ 105), Daniel Parker (8th @ 112), Ethan Gallo (4th @ 165), Capri Martin (4th @ 230) and Connor Bushey (6th @230). With the firepower that the Class of 2022 has, the overall team performance was less than par. Five NY grapplers from five different sections finished as all-americans. The lightest, at 120lbs, was Benny Rogers of Wantagh. Rogers would win 4 matches out of the gate before losing in the semi-finals. The backside wasn't too kind for Rogers as he would drop his final two matches finishing in 6th place. 2019 Section 3 Champion Kole Mulhauser of Central Square would finish in 8th place at 126lbs. At bowing out in round 2, Kole would reel off 5 straight wins, including a win over a West virginia State champion, to earn a spot in the round of 8. A loss and a default dropped Mulhauser to 8th place. A pair of 30 match winners also finished in 8th place over the weekend, Jake Trovato of Lindenhurst (160lbs) and Ryan Stein of Shaker (195lbs). 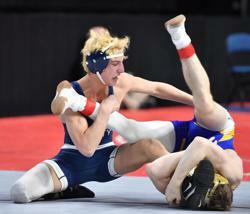 The final freshman all-american was Alex Semenenko of McKee Staten Island Tech of the PSAL. After losing in round 1 to eventual runner-up Levi Andrews of North Carolina, Semenenko would blast through the next four bouts before losing in the consi-semis. A 6th place finish capped off a solid NHSCA tournament for the 2019 PSAL bronze medalist. The sophomore class would put together quite the showing in VA Beach. Finishing second to Team Ohio, New York ended with three individual champions and 8 all-americans. Claiming titles for the empire state were Jordan Titus (120lbs) of Center Moriches, Todd Degroat (195lbs) of Vestal and Tyler Rice (285lbs) of Norwich. Titus would finish with an impressive 7-0 record. Five of his victories would go the distance including the championship win over Dustin Norris of Ohio 6-2. Degroat on the other hand would complete his championship run with a fall in each bout. Six straight pins for the Vestal Golden Bear including a :23 fall in the finale over Xavier Doolin of Missouri. Rice would finish the tournament 6-0 as well. Cruising through his first 4 opponents, Tyler would buckle down for the final 2 and win 1-0 and 3-1. Another New Yorker faired well in the 285lb class also. Minisink Valley's Adam Fenner, a 2019 Section 9 Champion, would finish in 3rd place and avenging a previous loss to Nate Miller of Pennsylvania in the bronze match. Dolgeville's Jake Null followed in his runner-up finish at the 2019 New York State tournament with a 5-2 record and a 4th place finish in VA beach. At 152lbs, Christian Hansen and Colden Dorfman would both finish on the podium in the end. The competitors would meet in the round of 8 with Hansen coming out victorious 10-2. In the end, Christian would finish in 6th place and Colden in 8th. Nine members of the class of 2020 left Virginia Beach with some hardware. All 9 were lightweights with the heaviest AA coming at 138lbs in 3x NYS place finisher Willie McDougald of Niagara Falls. En route to his 8th place finish, the 2018 NYS champion would defeat fellow NYer and Section 4 champion Drew Witham of Corning via fall. New York would have one finalist in the junior division, 2018 NYS champion Zach Redding of Eastport South Manor. Redding's opponent in the finale was Connecticut's Ryan Jack. The Danbury native was also in the same bracket as Redding at the 2019 Eastern States Classic. The two could have met in the finals however Redding dropped his semis match against Wyoming Seminary's Zach Escalera 10-7. This past weekend, these two giants would not be denied a second chance meet in the finals on such a grand stage. Jack would prove too much for the ESM shark as he defeated Redding 12-5. Fellow Suffolk County wrestler Gavin Damasco of Commack, whom also placed at 126lbs, went 7-2 and placed 7th. At 113lbs, many fans had the privilege of watching two NYS finalists from separate divisions wrestle each other. In the 7th place match, we saw Lowville's Micah Roes and Wantagh's Josiah Encarnacion battle it out in a classic D1 vs D2 showdown. The cat and mouse game would come down to stall calls as Roes would defeat Encarnacion 3-1. Two suffolk county wrestlers placed at 106lbs as Bay Shore's Elijah Rivera and Patchogue-Medford's Anthony Spataro took 6th and 8th respectively. After losing in round 1, Spataro would defeat fellow NYers Dominic Affronti of Palymra Macedon 6-3 and Kyle Shriberg of Locust Valley 6-2 en route to his 8th place finish. A solid 3rd place finish by the NY seniors is a great way to go out. For some, this may be the final tournament of their lives. Eight seniors ended with a podium finish. Rocky Point's Corey Connolly would be the highest finisher as he would take 2nd at 160lbs. Central Valley's Hunter Shaut was also in the 160lb bracket. The 2x NYS champion would lose in the round of 16 on the front side. Shaut would wrestle his way back to a 5th place finish. Four New York State champions from 2019 ended their careers and can now call themselves NHSCA all-americans. At 126lbs James Ryan of Monsignor Farrell went 5-2 and finished 7th. Also finishing 7th with an identical 5-2 record was Duanesburg's Zach Lawrence at 152lbs. Tioga's John Worthing wrestled extremely well en route to his 4th place finish. On the backside, Worthing's methodical style won him 3 straight matches before falling in the consi-finals to Nevada's Dyllan Fuchs. The final NYS Champion All-American was Commack's Joey Slackman. A semi-final loss wouldn't stop Slackman as he finished his career with a solid 1-0 and 4-2 decision and a 3rd place finish at heavyweight. North Babylon's Sean Carter (5th @120) and St. Anthony's Preston Maucere (4th @ 132) rounded out the placers for team NY.